Many of the midday workers work for as low as 40 cents a day. On February 8, mid-day meal workers from all over India will stage protests in solidarity with nearly 250,000 of their colleagues from the State of Bihar, who have been on an indefinite strike since January 7, demanding minimum wage and other benefits like social security and labor laws. The mid-day meal scheme has been one of the most socially transformative schemes in the country, providing meals for school students that increase attendance and ensure nutrition. Protests will be organized in most parts of the country on February 8. In Delhi, midday meal workers from Haryana will hold a demonstration, and burn the effigy of Prime Minister Narendra Modi. 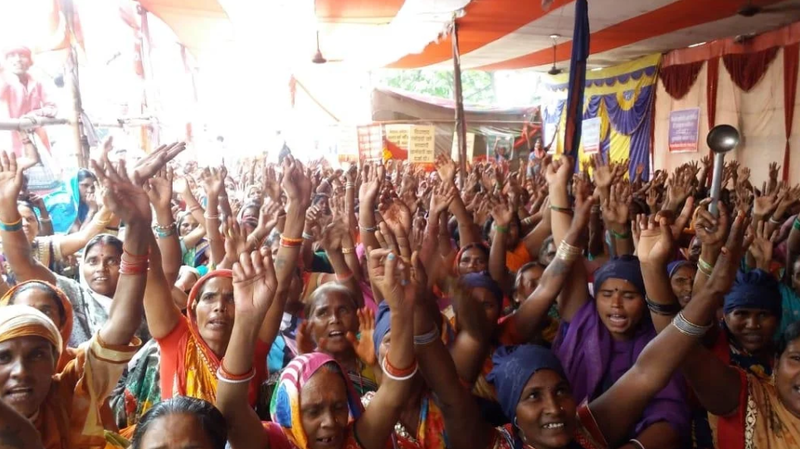 Talking to NewsClick, Anju Maini, the treasurer of All India Federation of Anganwadi Workers and Helpers (AIFAWH), affiliated to the Centre of Indian Trade Unions (CITU), said, “We will protest the false promises being made by the Central and State governments. The salaries received by the midday meal workers is abominable. In some states, like Haryana, an honorarium of Rs. 1,000 (USD13.8) is paid to the workers by the Dentral government. The State government pays them another Rs. 2,000 (USD27). This itself is an incredibly low amount.” She said that in some States, the situation is even worse. The workers are only paid the honorarium provided by the Central government, and in certain cases, even that amount is divided between the cooks and the helpers. Maini also said, “The workers are paid the honorarium for 10 months in a year, instead of all 12 months. This is an unfair practice.” The same issue has been raised by the striking midday meal workers in Bihar, who are mostly women. AIFAWH has also called for a huge demonstration in New Delhi on February 25 against the non-allocation of adequate funds, against cash transfer and for the implementation of the 45th Indian Labour Conference recommendations on minimum wages and pension for scheme workers. The strike by the midday meal workers in the State of Bihar was organized under the banner of Bihar Rajya Madhayan Bhojan Rasoiya Sanyukt Sangarsh Samiti. It is a joint struggle of different federations and associations of mid-day meal workers supported by four trade unions – Centre of Indian Trade Union (CITU), All India Trade Union Congress (AITUC), The All India United Trade Union Centre (AIUTUC) and All India Central Council of Trade Unions (AICCTU). Their demands include a higher honorarium, government employee status, and Rs 18,000 monthly wages till they are declared government employees. Last year, too, the cooks staged a protest in Patna and other places in the State. AICCTU leader Saroj Choubey, who is state president of Bihar Rajya Vidhalya Rasoiya Sangh, said the condition of the cooks was very pathetic. About 90% of the cooks are women in the State of Bihar. ”Most of them are widows and BPL (below poverty line) category from the marginalized and depressed sections of society. They belong to the poorest of the poor background but government is treating them badly. Other than them, who will work for Rs. 33 (less than 50 cents) per day?” she added. Hey Buddy!, I found this information for you: "Mid-day meals workers across India to stage protest on February 8". Here is the website link: https://peoplesdispatch.org/2019/02/07/mid-day-meals-workers-across-india-to-stage-protest-on-february-8/. Thank you.